Stem Cell Factor or SCF is a small peptide that circulates throughout the bloodstream and eventually finds its way to the bone marrow where it summons bone marrow-based stem cells to the sight of injury for tissue repair purposes. Unfortunately, it takes injured tissues time to express SCF at high enough levels to recruit bone marrow stem cells to come and accelerate tissue healing. This is particularly the case in the heart after a heart attack. For this reason, scientists are trying to find new and better ways to increase SCF production in the damaged heart. To that end, cardiologists at the Icahn School of Medicine at Mount Sinai have discovered that delivering SCF directly to damaged heart muscle after a heart attack seems to augment heart muscle repair and regenerate injured tissue. “Our discoveries offer insight into the power of stem cells to regenerate damaged muscle after a heart attack,” said lead study author Kenneth Fish, Director of the Cardiology Laboratory for Translational Research, Cardiovascular Research Center, Mount Sinai Heart, Icahn School of Medicine at Mount Sinai. In this study, Fish and his colleagues used gene transfer to administer SCF to the heart shortly after inducing heart attacks in a pig model system in order to test its regenerative repair response. Fish and his coworkers developed a novel SCF gene transfer delivery system that stimulated the recruitment and expansion of adult cardiac stem cells directly to injury sites that reversed heart attack damage. In addition, the gene therapy improved cardiac function, decreased the death of heart muscle cells, increased regeneration of heart tissue blood vessels, and reduced the formation of heart tissue scarring. The cell surface receptor for SCF is the c-Kit protein, and cells that possess the c-Kit protein are called c-Kit+ cells. c-Kit+ cells not only respond to SCF, but serve as resident cardiac stem cells that naturally increase in numbers after a heart attack and through cell proliferation are directly involved in cardiac repair. To date, there is a great need for new interventional strategies for cardiomyopathy to prevent the progression of this disease to heart failure. Heart disease is the number one cause of death in the United States, with cardiomyopathy or an enlarged heart from heart attack or poor blood supply due to clogged arteries being the most common cause of the condition. Cardiomyopathy also causes a loss of heart muscle cells and changes in heart shape, which lead to the heart’s decreased pumping efficiency. “Our study shows our SCF gene transfer strategy can mobilize a promising adult stem cell type to the damaged region of the heart to improve cardiac pumping function and reduce myocardial infarction sizes resulting in improved cardiac performance and potentially increase long-term survival and improve quality of life in patients at risk of progressing to heart failure,” says Dr. Fish. “This study adds to the emerging evidence that a small population of adult stem cells can be recruited to the damaged areas of the heart and improve clinical outcomes,” says Dr. Hajjar. Dystrophic epidermolysis bullosa (RDEB) is an inherited skin disease that causes fragile skin. RDEB is caused by mutations in the gene that encoded a protein called type VII collagen. Because collagen is a major structural component of skin, collagen mutations result in fragile skin and mucous membranes that blister easily if they are subjected to even slight mechanical stresses. There are no cures for such diseases, but skin creams and palliative care can decrease the severity of the symptoms. Induced pluripotent stem cells (iPSCs) have the ability to treat such genetic diseases. In order to provide proof of principle of the applicability of iPSCs for the treatment of RDEB, Daniel Wenzel and his colleagues in the laboratory of Arabella Meixner from the Institute of Molecular Biotechnology of the Austrian Academy of Sciences in Vienna, Austria made iPSCs from mice that harbored mutations in the gene that encodes type VII collagen (Col7a1) and exhibited skin fragility and blistering. The symptoms displayed by these Col7a1-mutant mice resembled human RDEB. Wenzel and his coworkers then genetically repaired the Col7a1 mutations in these iPSCs, and then differentiated these cells into functional fibroblasts that expressed and secreted normal type VII collagen. When implanted, the genetically-repaired iPSC–derived fibroblasts did not form tumors, and could be successfully traced up to 16 weeks after intradermal injection. Therapy with iPSC-derived fibroblasts also resulted in faithful and long-term restoration of type VII collagen deposition at the epidermal-dermal junction of Col7a1 mutant mice, and restored the resistance of the skin to mechanical stresses. Thus, intradermal injection of genetically repaired iPSC-derived fibroblasts restored the mechanical resistance of the skin to blistering in RDEB mice. These data demonstrate that, at least in principle, RDEB skin can be effectively and safely repaired using a combination of gene therapy and iPSC-based cell therapy. A similar study examined another type of epidermolysis bullosa. Noriko Umegaki-Arao and her colleagues in the laboratory of Angela Christiano from Columbia University used iPSCs to treat mice with a distinct type of epidermolysis bullosa that resulted from mutations in COL17A1 gene, which encodes type XVII collagen (Col17). In this case, however, the mutation has been observed to revert or fix itself in patients. Patients tend to have patches of skin that are normal in a sea of abnormal skin. Therefore, Umegaki-Arao and her coworkers derived iPSCs from Col17-mutant mice, differentiated them into skin cells (keratinocytes) and then cultured them, examining individual clones for reversion to normal Col17, which was fairly easy to do as it turns out. Once revertant-iPSC keratinocytes were properly secured, and then used them to reconstitute human skin in mutant mice. Thus, revertant keratinocytes can be a viable source of spontaneously gene-corrected cells for developing iPSC-based therapeutic approaches in the treatment of epidermolysis bullosa. Professor Per-Olof Berggren Rolf Luft at the Research Center for Diabetes and Endocrinology at Karolinska Institutet has led an important study in collaboration with Alejandro Caicedo at University of Miami Miller School of Medicine and Hong Gil Nam at DGIST from the Republic of Korea that demonstrates that young capillary vessels can rejuvenate aged pancreatic islets. This study was published in the Proceedings of the National Academy of Sciences, USA and challenges prevailing views on the causes of age-dependent impaired glucose balance regulation, which often, in older patients, develops into type 2 diabetes mellitus. These results suggest that treating inflammation and fibrosis in the small blood vessels of the pancreatic islets might provide a new way to treat age-dependent dysregulation of blood glucose levels. “This is an unexpected but highly important finding, which we expect will have a significant impact on diabetes research in the future. The results indicate that beta cell function does not decline with age, and instead suggest that islet function is threatened by an age-dependent impairment of vessels that support them with oxygen and nutrients”, says Berggren. Pancreatic beta cells are in the pancreatic islets and secrete the hormone insulin, which regulates blood glucose levels and also is one of the most important anabolic hormones of the human body. Ageing may lead to a progressive decline in glucose regulation which may contribute to the onset of diabetes. Generally, it has been assumed that this is due to reduced capacity of the beta cell to secrete insulin or multiply. “In the study we challenged the view that the age-dependent impairment in glucose homeostasis is solely due to intrinsic, dysfunction of islet cells, and hypothesized that it is instead affected by systemic aging factors”, says first author Joana Almaça at the Diabetes Research Institute, University of Miami. Even though the common wisdom in modern medicine is that insulin-producing pancreatic beta cell lose function through the constant demands on them, Berggren and his collaborators showed that mouse and human beta cells are fully functional at advanced age. When they replaced the islet vasculature in aged islet grafts with young capillaries, the investigators found that the islets were rejuvenated and glucose homeostasis fully restored. “While expanding beta cell mass may still be desirable for future diabetes therapy, improving the local environment of the otherwise healthy aged beta cell could prevent age-associated deterioration in glucose homeostasis and thereby promote healthy ageing, which is conceptually novel and highly exciting”, says Per-Olof Berggren. Mesenchymal stem cells from umbilical cord have the ability to differentiate into cartilage cells, fat cells, bone cells, and blood vessels cells. These cells also are poorly recognized by the immune system of the patient and are at a low risk of being rejected by the patient’s immune system. Valeria Aguilera and her colleagues from the laboratory of Claudio AguayoWe at the University of Concepción, Chilee have evaluated the use of mesenchymal stem cells from umbilical cord in the formation of new blood vessels in damaged tissues. Wharton’s jelly mesenchymal stem cells of hWMSCs were used to potentially accelerate tissue repair in living animals. Aguilera and her co-workers began by isolating mesenchymal stem cells from human Wharton’s jelly (a connective tissue in umbilical cord). Then they grew these cells in culture for 14 or 30 days. Interestingly, the longer the WMSCs grew in culture, the more they looked like blood vessel cells. They began to express blood vessel-specific genes and proteins. WMSCs cultured for 30 days were even more like blood vessels than those grown in culture for 14 days. 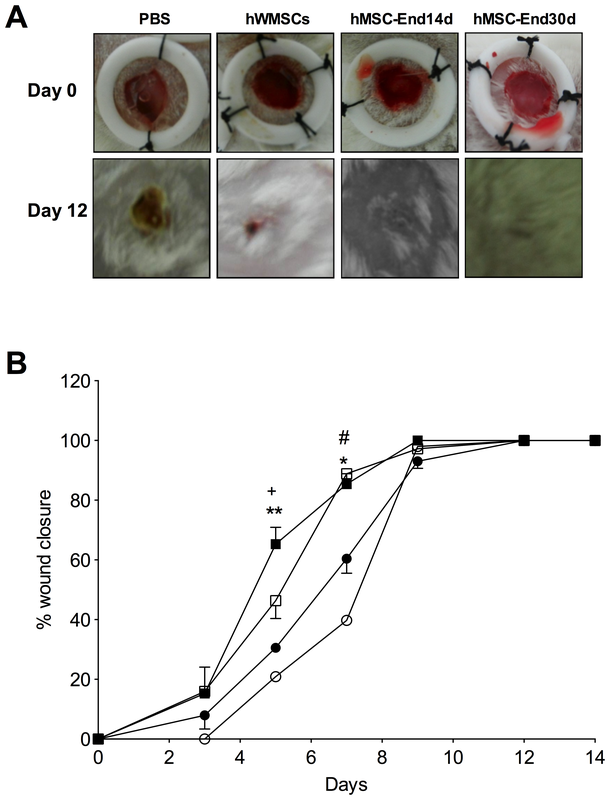 When these cells were injected in the mice with damaged skin, the results showed that the WMSCs cultured for 30 days significantly accelerated wound healing compared with animals injected with either undifferentiated hWMSCs or with no cells. 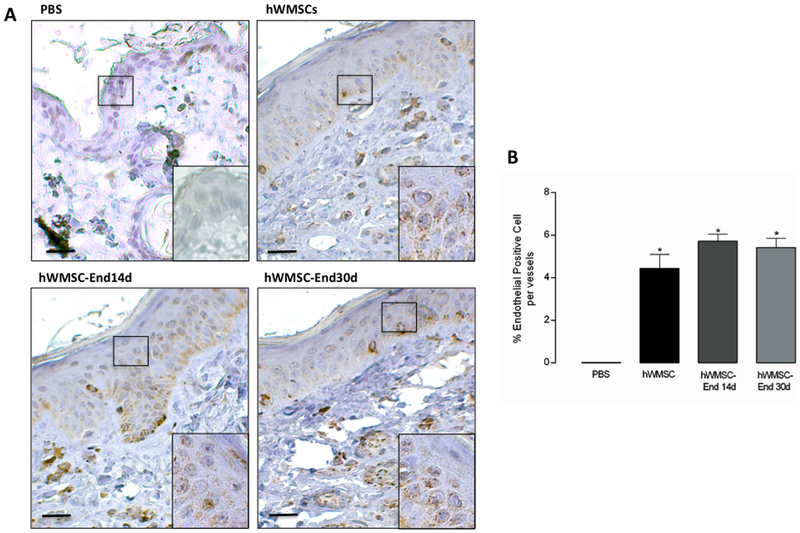 Effect of hWMSCs and endothelial-differentiated hWMSC transplantation in a wound-healing model. The wounds of mice treated with the WMSCs cultured for 30 days looked healthier, but they had many more blood vessels. Histologic analysis of wounds in the wound-healing model. When laboratory animals received the culture medium from the WMSCs cultured for 30-days also showed significant acceleration of their healing, which suggests that these cells secrete a host of healing molecules that induced the formation of new blood vessels. One might also conclude that the implanted WMSCs did not contribute to the formation of new blood vessels, but simply directed the formation of new blood vessels by secreting healing molecules. However, when WMSCs were detected in the healed tissue, they were predominantly found in the walls of new blood vessels. Immunohistochemical detection of human mesenchymal cells in a wound-healing model. A. Immunohistochemical staining of human mitochondria was performed in permeabilized tissue sections obtained after 12 days of subcutaneous injection of PBS, hWMSCs, hWMSC-End14d or hWMSC-End30d in mice. Cell nuclei were stained with hematoxyline. In B. Number of positive cells per vessel. Representative images of 5 independent experiments, in duplicate. Magnification x40 and insert 100x. Bars 50 µm. These results, which were published in PLOS ONE, demonstrate that mesenchymal stem cells isolated from umbilical cord connective tissue or Wharton’s jelly can be successfully grown in culture in the laboratory and trans-differentiated into blood vessels-forming cells (endothelial cells). These differentiated hWMSC-derived endothelial cells seem to promote the formation of new networks of blood vessels, which augments tissue repair in laboratory animals through the secretion of soluble pro-blood vessel-making molecules and, occasionally, by contributing to the formation of new vessels, themselves. Healthline has a very nice, new graphic that illustrates the risks for heart disease different people may have. I highly recommend this website. Researchers from Stanford University have shown that genetic differences in mitochondria found in cells made from pluripotent stem cells that were originally derived from cloned embryos can prompt rejection by the immune system of the host animal from which they were made, at least in mice. According to a study in mice by researchers at the Stanford University School of Medicine and colleagues in Germany, England and at MIT, cells and tissues in mice made from cloned embryos are rejected by the body because of a previously unknown immune response to the cell’s mitochondria. These findings reveal a likely hurdle if such therapies are ever used in humans. Regenerative therapies that utilize stem cells have the potential to repair organs, replace dead or dying tissues, and treat severe diseases. Many stem cell scientists think that pluripotent stem cells, which can differentiate into any kind of cell in the body, show the most promise for regenerative medical applications in the clinic. One method for deriving pluripotent stem cells that have the same genetic composition as that of the patients is called somatic cell nuclear transfer (SCNT) or cloning. This method takes the nucleus of an adult cell and injects it into an egg cell from which the nucleus has been removed. SCNT can potentially make pluripotent stem cells that can repair a patient’s body. “One attraction of SCNT has always been that the genetic identity of the new pluripotent cell would be the same as the patient’s, since the transplanted nucleus carries the patient’s DNA,” said cardiothoracic surgeon Sonja Schrepfer, MD, PhD, who was the co-senior author of the study, which was published online Nov. 20 in Cell Stem Cell. “The hope has been that this would eliminate the problem of the patient’s immune system attacking the pluripotent cells as foreign tissue, which is a problem with most organs and tissues when they are transplanted from one patient to another,” added Schrepfer, a visiting scholar at Stanford’s Cardiovascular Institute, and Heisenberg Professor of the German Research Foundation at the University Heart Center in Hamburg, and at the German Center for Cardiovascular Research. Several years ago, Stanford University professor of pathology and developmental biology, Irving Weissman, MD, chaired a National Academies panel on SCNT cells. At this time, he raised the possibility that the immune system of a patient who received the cells derived from stem cells made from cloned embryos might still generate an immune response against proteins from the cells’ mitochondria. Mitochondria are the energy factories for cells, and they have their own genetic system (a DNA chromosome, protein-making structures called ribosomes, and enzymes for expressing and replicating DNA). This reaction could occur because cells created through SCNT contain mitochondria from the egg donor and not from the patient, and therefore could still appear as foreign tissue to the recipient’s immune system. There were other indications that Weisman was probably correct. An experiment that was published in 2002 by William Rideout in the laboratory of Rudolf Jaenisch at the Whitehead Institute for Biological Research in the journal Cell derived embryonic stem cells from cloned mouse embryos and then differentiated those embryonic stem cells into bone marrow-based blood making stem cells. These blood making stem cells were then used to reconstitute the bone marrow of a mouse that had a mutation that prevented their bone marrow from forming normal types of disease-fighting white blood cells. However, even though the recipient mouse was genetically identical to the embryonic stem cells that had been used to derived the blood-making stem cells, the immune systems of the recipient mouse still rejected the implanted cells after a time. Weissman, however, was not able to directly test this claim himself at that time. Weissman directs the Stanford Institute for Stem Cell Biology and Regenerative Medicine, and now, in collaboration with Schrepfer and her colleagues, he was able to test this hypothesis. Schrepfer, who heads the Transplant and Stem Cell Immunobiology Laboratory in Hamburg, used cells that were created by transferring the nuclei of adult mouse cells into enucleated eggs cells from genetically different mice. When transplanted back into the nucleus donor strain, the cells were rejected although there were only two single nucleotide substitutions in the mitochondrial DNA of these SCNT-derived cells compared to that of the nucleus donor. “We were surprised to find that just two small differences in the mitochondrial DNA was enough to cause an immune reaction,” she said. “We didn’t do the experiment in humans, but we assume the same sort of reaction could occur,” Schrepfer added. Until recently, researchers were able to perform SCNT in many species, but not in humans. However, scientists at the Oregon Health and Science University announced the successful derivation of human embryonic stem cells from cloned, human embryos. This reignited interest in eventually using SCNT for human therapies. Although many stem cell researchers are focused on a different method of creating pluripotent stem cells, called induced pluripotent stem cells, some believe that there are some applications for which SCNT-derived pluripotent cells are better suited. The immunological reactions reported in the new paper will be a consideration if clinicians ever use SCNT-derived stem cells in human therapy, but Weissman thinks that such reactions should not prevent their use. “This research informs us of the margin of safety that would be required if, in the distant future, we need to use SCNT to create pluripotent cells to produce the tissue stem cells to treat someone,” he said. “In that case, clinicians would likely be able to handle the immunological reaction using the immunosuppression methods that are currently available.” I find such a statement somewhat cavalier given that the nature of the immunological rejection might be robust enough to endanger the patient regardless of the anti-rejection drugs that are used. In the future, scientists might also lessen the immune reaction by using eggs from someone who is genetically similar to the recipient, such as a mother or sister, Schrepfer added. Except that now you have added the dangers of egg retrieval to this treatment regimen, which not only greatly jacks up the price of this type of treatment, but now endangers another person just to treat this one patient. Add to that the fact that you are making a cloned human embryo (a very young person) for the sole purpose of dismembering it, and now you have added a degree of barbarism to this treatment as well. So if we some SCNT-based treatments for patients we have an added danger for the patient (immunological rejection), danger for the egg donor, the homicide of the young embryo, and a prohibitively expensive procedure that no insurance company in their right mind would fund. I say we abandon this mode of treatment for the morally-bankrupt option that it is and pursue more ethical ways of treating patients. Suchitra Sumitran-Holgersson and Michael Olausson from the Sahlgrenska Academy have designed a new way to make blood vessels that takes only seven days and a few tablespoons of blood. Thanks to their new procedure, the ability to make new tissues from stem cells has taken a huge stride forward. Three years ago, a patient at Sahlgrenska University Hospital received a blood vessel transplant grown from her own stem cells. Suchitra Sumitran-Holgersson, Professor of Transplantation Biology at Sahlgrenska Academy, and Michael Olausson, Surgeon/Medical Director of the Transplant Center and Professor at Sahlgrenska Academy, came up with the idea, planned and carried out the procedure. Now Sumitran-Holgersson and Olausson have published a new study in the journal EBioMedicine based on two other transplants that were performed in 2012 at Sahlgrenska University Hospital. The patients in this procedure were two young children who were afflicted with the same condition as in the first patient. All three patients were missing the vein that goes from the gastrointestinal tract to the liver. The extreme youth of these patients motivated Sumitran-Holgersson find a new way to extract these stem cells. She came upon the extraction of stem cells from 25 millilitres (approximately 2 tablespoons) of blood, which is the minimum quantity of blood needed to obtain enough stem cells. 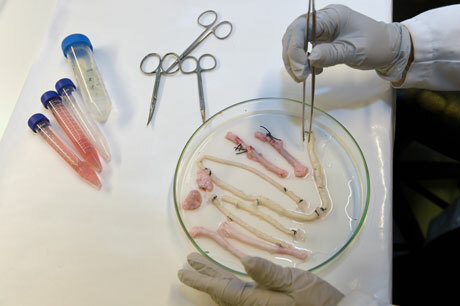 Then they used a novel technique to generate transplantable vascular grafts by using decellularized allogeneic vascular scaffolds that were then populated with peripheral whole blood and then grown in a bioreactor. Circulating, VEGFR-2 +/CD45 + and a smaller fraction of VEGFR-2 +/CD14 + cells largely repopulated the graft to form new vessels for transplantation. Olausson and Sumitran-Holgersson have treated three patients so far, two children and one adult. Two of the three patients have recovered well and have veins that are functioning normally. In the third case the child is under medical surveillance and the outcome is less certain. The technology for creating new tissues from stem cells has taken a giant leap forward. Two tablespoons of blood are all that is needed to grow a brand new blood vessel in just seven days. This is shown in a new study from Sahlgrenska Acadedmy and Sahlgrenska University Hospital published in EBioMedicine. These studies show that it is feasible to avoid taking painful blood marrow samples to extract stem cells for blood vessel production, and that it is equally feasible to produce those blood vessels in a matter of a week.